I need to start this piece with a disclaimer: I'm not qualified to write a life-changing, instructive piece about tidying up. Inside my ankle boots, you'll usually find a pair of mismatched socks. Look in any of my handbags and there will be a hefty layer of random receipts and year-old train tickets. I've been known to keep my passport in the same drawer as my tights, and I own 13 European plug adaptors because I can never find one when I'm about to head to the airport. However, I moved flats in December, bought Marie Kondo's The Life-Changing Magic of Tidying Up, did a car boot sale, sold three things on Depop, sent 12 bags to a charity shop, three to SmartWorks, one to a recycling bin and halved my wardrobe. I'm sure my handbags will continue to be filled with a bizarre paper trail, and today I've got odd socks concealed under my Chelsea boots, but there are several lessons I learned from my ruthless cull that will change how I dress and consume fashion for years. I held onto items that didn't suit me for so long because I felt guilty. I felt guilty I wasted the money, that I didn't appreciate a thoughtful present enough and that I'd be getting rid of memories I should be holding onto for when I'm older. The latter made me keep a T-shirt from my university rowing club for eight years. I was a member of said club for six weeks. Marie Kondo's method says that you should hold onto your items one by one and see if they "spark joy." You should only keep the things that make you happy — and if they don't spark joy, you should say thank you and goodbye to them, offloading this feeling of guilt. I didn't say thank you to the clothes I discarded because I'm way too British for that. But I did learn that you can appreciate something without having space for it anymore. One thing that really helped me to overcome this feeling of guilt was to donate pieces to SmartWorks—the charity that dresses and coaches women before job interviews and gives them a capsule workwear wardrobe when they get the job. I had a Zara tote I once wore every day but was no longer my go-to. A leather clutch bag that for years had felt too good to get rid off. So perhaps the secret to culling supposedly special items lies in knowing that they're going somewhere great to live their second life. At one quick glance you can see that jackets, dresses and knitwear are the things I wear the most. Some things were an easy decision. I don’t need all the dust bags tucked away in random boxes or the 20 scruffy canvas tote bags I had lining the bottom of my wardrobe. Other things were harder, such as a pair of Sophia Webster shoes (a size too small) I bought in a sample sale four years ago and were one of the most beautiful things I owned. I had decided they'd be my display shoes instead of shoes I'd wear, but all the excited messages I got about them on Depop made me realise it’s better someone owns them who can actually put her toes inside them without screaming. The hardest thing for me to grasp was that if I don’t wear or love something enough, it doesn’t matter what brand it is or how much I loved it five years ago. I had a velvet cropped Tommy Hilfiger jumper I agonized over buying as it was a real splurge for me and I wore it constantly in my early 20s, but it just felt too young for me to wear now. I was still so unsure about whether I should let it go as I packed it into the suitcase for my carboot, but I sold it to a girl who was so excited and surprised to have found it among the rail. Another Marie Kondo mantra is that you need to see everything in your wardrobe so she folds pieces vertically in a drawer rather than stacking them up, so you can see every T-shirt or jumper in one glance. This has made the biggest difference to how I get dressed every morning—and has really helped me understand the things I wear the most. It also stops items from being neglected in the bottom of a pile, which tends to warrant them useless and in desperate need of ironing. And ironing is the devil when it comes to actually putting clothes on each morning. One thing clearly brings me joy: blazers. Now that I've gotten rid of the things that don't fit properly and I never feel good in, I can start afresh on the things that do make me feel good. I've realised where the gaps are in my wardrobe. I own more than 30 dresses, for example, but don't own a single belt. That's going to be something I purchase in 2019 before buying into any trends. Getting all my clothes out at once and really thinking about why they make me happy has helped me understand the things that work for me and why. 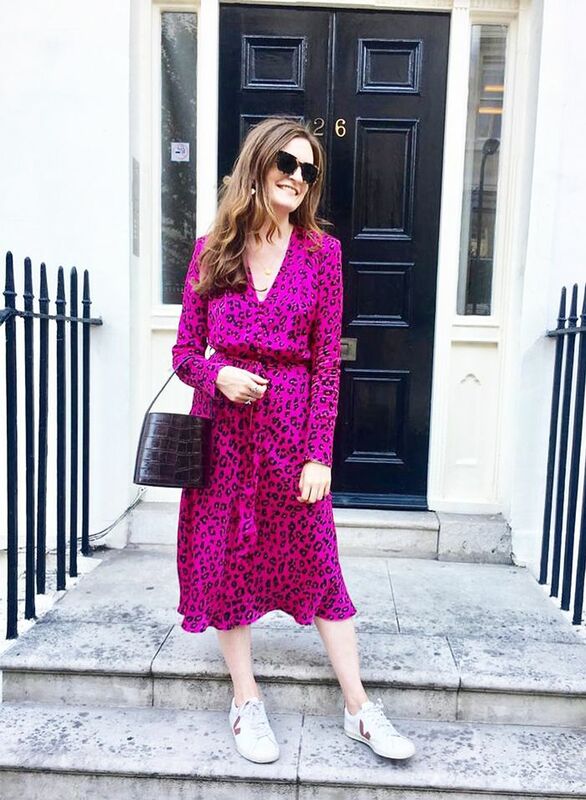 Printed dresses, blazers and chunky knitwear are the three things that consistently passed my joy test, so I have made sure these are the most visible in my wardrobe, and I start putting my outfits together with one of these three items. I'm a classic dresser, and I never feel like myself in anything too shouty or statement, so this was a lesson to be wary when adopting passing trends. I don't like to admit that in my charity shop bags were several pieces that still had the tags on. This included a sheer yellow Zara blouse I bought during lunchtime and never wore, as I always felt it was too see-through and the fabric looked too creased. As a fashion editor, I consider it my job to promote buying timeless pieces that will last and don't want to ever buy something I won't wear ever again. I'm instigating a two-week rule: If I don't wear something within two weeks of buying it, I just don't love it enough. It's a bit of a running joke in the Who What Wear office how indecisive I am. If someone says "What do you want for lunch?" I always automatically reply "Hmm, I don't know, what do YOU want for lunch?" On my birthday, I made my team wander aimlessly for 10 minutes before making the radical decision that we'd go to Leon. I can tell other people what to buy every day as part of my job but have always found it difficult to decide whether something's worth investing in. This culling process has changed those feelings of doubt. I made four purchases this year without boring my team with my usual back and forth. "You bought something without asking us?!" my boss of two years asked me when an ASOS parcel arrived at my desk. "Erm, what has happened to Emma Spedding?" Maybe this wardrobe cull has been pretty life changing after all. It helped me understand the silhouettes that work for me and what I actually want to wear. I'm focusing on my favourite pieces and buying things specifically to go with those. No one else will have noticed that I'm dressing any differently post clear-out, but I can get ready faster in the morning, and I've certainly got more compliments on what I've worn in 2019. I'm wearing the same outfits and the same old clothes, but rotating pieces more and feeling more confident in, as cheesy as it sounds, knowing what will bring me joy. My final tip for you: Watch Marie Kondo's Netflix show while clearing your wardrobe. Watching other people's out-of-control messes will help you feel better about your own. Use these to protect against moths. These stop clothes from falling off the hangers onto the floor. A makeup tower? Talk about sparking joy. I use a similar box for my jewellery. I use this to store my perfumes and face oils. Next up, we have even more wardrobe organising tips if you're serious about doing a clearout.